Redis, the world’s most popular in-memory database platform, has been the choice of developers worldwide for delivering millions of operations per second at sub-millisecond latencies with the fewest resources. Redis Enterprise technology encapsulates open source Redis, while fully supporting all of its commands, data structures, and modules. It adds exceptional flexibility, stability, high performance, and unmatched resilience with multiple deployment options and topologies that include CRDT based geo-distributed Active-Active architectures, built-in secondary indexing and support for very large data sizes by extending to SSDs. Redis Enterprise enhances popular Redis use cases like high speed transactions, job & queue management, user session stores, real-time data ingest, notifications, content caching, time-series data and many more. 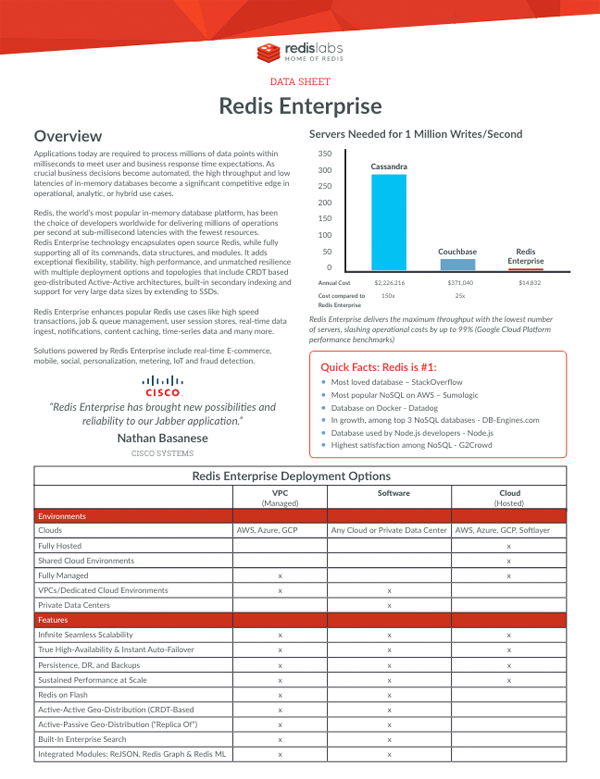 Download the datasheet and explore more about Redis Enterprise and its deployment options – as a software, fully managed service in your VPC, and hosted service on popular cloud platforms.